Living up to the heavy demands of our team, the K2 Afterblack is a true-twin snowboard that's fixated on freestyle performance. Camber between the feet gives the Afterblack stability and pop for jumps and the rest of the resort, but a softer rockered tip and tail allow this board to be flexible and responsive for riding rails and hitting every side hit possible. Living up to the heavy demands of our team, the K2 Afterblack is a true-twin snowboard that&apos;s fixated on freestyle performance. 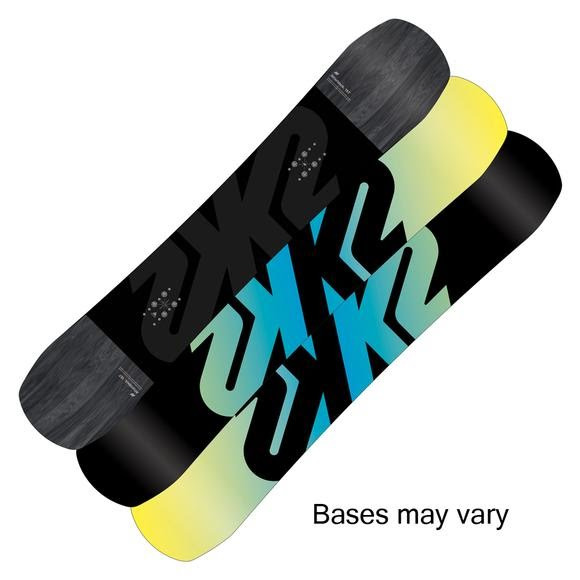 Camber between the feet gives the Afterblack stability and pop for jumps and the rest of the resort, but a softer rockered tip and tail allow this board to be flexible and responsive for riding rails and hitting every side hit possible. K2 Men&apos;s Afterblack (Regular and Wide) Snowboard Size Chart Size (CM) Set Back Waist Width (CM) Weight Range (LB) Side Cut (M) Effective Edge (CM) Tip Width (CM) Tail Width (CM) Stance Width (IN) 154 0" Centered 25.2 120-190+ 8.1 116.84 29.5 29.5 21" 157 0" Centered 25.4 130-200+ 8.2 119.38 29.8 29.8 22" 159W 0" Centered 26.3 130-230+ 8.2 116.84 30.9 30.9 22"